Tag line: "What happened to Emily?" With superior performances and a chilling back story, The Exorcism of Emily Rose combines psychological horror with a courtroom drama to tell the tale of a troubled girl and the priest who tried to save her. 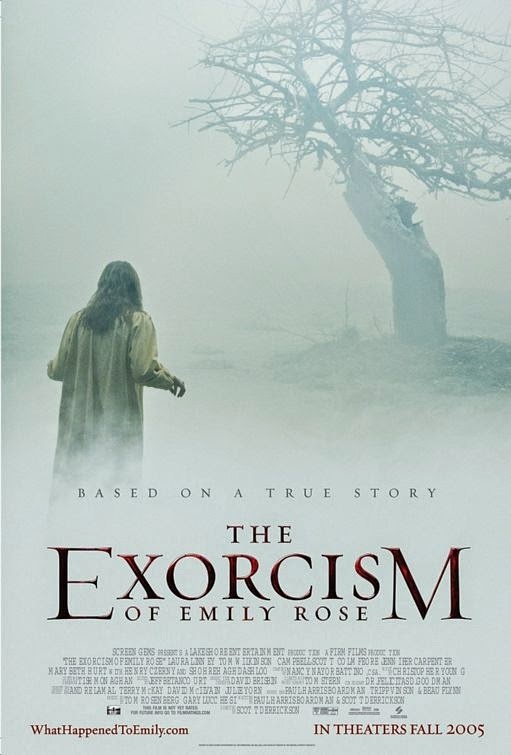 Based on an actual event that occurred in Germany in 1976, The Exorcism of Emily Rose tries to figure out what happened to poor Emily Rose (Jennifer Carpenter), a young woman who, by all appearances, led a very normal life. That all changed, however, when she went away to college, where she was haunted by horrific images and, at times, even tormented by an unseen entity. Convinced their daughter was medically sound, Emily’s parents instead turned to Father Richard Moore (Tom Wilkinson), a Catholic priest, for guidance. He believed the unfortunate girl was the victim of a demonic possession, but when Emily died shortly after undergoing an exorcism, Father Moore was arrested and charged with her death. During his trial, Father Moore, aided by his skeptical defense attorney Erin Bruner (Laura Linney), hoped to tell Emily’s story, while at the same time trying to convince the jury, as well as the entire world, that the devil does exist. The courtroom scenes in The Exorcism of Emily Rose are exemplary, with Laura Linney turning in a strong performance as Erin Bruner, the agnostic who must set her doubts aside to protect a man of the cloth. At one point, Bruner calls Father Moore himself to the stand and plays an audiotape she received from a Dr. Cartwright (Duncan Fraser), a medical physician who was present at Emily’s exorcism. As the tape, which was recorded during the exorcism, plays, the movie flashes back to show us exactly what happened the night in question (needless to say, it was a pretty memorable evening). In fact, Emily’s entire story is told by way of a series of flashbacks, all of which detail her terrifying experiences (the one that scared the bejesus out of me occurred while Emily was sitting in a classroom, where she saw a classmate’s face transform before her eyes, taking on the features of a demon). A horror / drama that also has something to say about the nature of faith, The Exorcism of Emily Rose gives us plenty to think about while it’s frightening the pants off of us. Wonderful review! However, I think the German film REQUIEM (2006) about the same tale is far superior. Did you see it?